Whereas the reasons for going to Amsterdam are clear to anyone, I’d like to give Excel lovers out there the greatest reason of all, to visit Amsterdam on the 18th and the 19th of April 2017. I’m guessing most of you know what I’m talking about. It’s the Amsterdam Excel Summit 2017. A single annual event in Europe that has many of the greatest minds of Excel in one place at one time. And this year, after being an innocent bystander for two years now (2015 Amsterdam Excel Summit Report, 2016 Amsterdam Excel Summit Report), this year I’ll be one of the Excelebrities (I know it’s not a real word but I love it) presenting there. But since I was there to gather knowledge for two years running now, I can honestly say that this collection of Excel MVP’s combined with a very casual atmosphere thrown against a backdrop of Amsterdam is more that any Excel enthusiast could ever wish for. And it will amaze you, (as well as it did me), just how approachable and down to earth these guys are, and how easy it is, to strike a conversation with them. 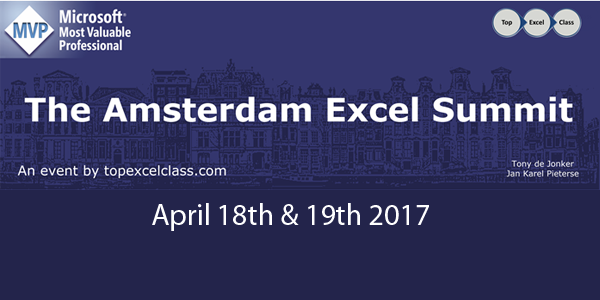 So, if you ever wanted to go to Amsterdam (who hasn’t), and you love Excel, this is the time. And if you need extra reasons, just continue reading. This event is hosted by Jan Karel Pieterse and Tony De Jonker and the format of the event will be similar to last year, starting with a Masterclass on day one (18th) and a two track, session filled Summit on day two (19th). The whole agenda for the event is posted here. Excel Data Analysis And Reporting Masterclass will include a mix of all flavors. I’ll be opening with a Streaming Datasets in Power BI session, which will be followed by Oz Du Soleil‘s session on Power Query. Check out his site http://datascopic.net/ and check out his latest videos on his YouTube Channel called Excel On Fire. 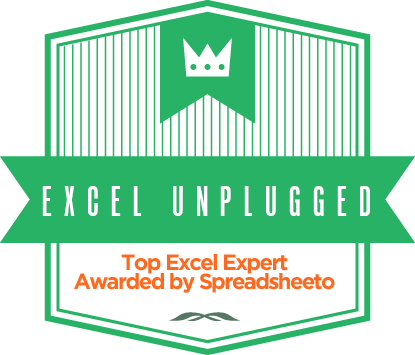 After Lunch you will be greeted by the presence of the one and only Jon Peltier who you should be familiar with as the right address for all chart related questions in Excel. I’m sure you know his site called http://peltiertech.com/. And finally, David Hoppe will wrap things up with a session entitled Reverse-Engineering an Excel dashboard. More about David on his site http://excelusive.com/. This Masterclass will take you on quite a journey. From Power Query to get data, Excel to do calculations and charting to present our data, but we don’t stop there, in the last session, we go back in reverse J. And on the second day (The Amsterdam Excel Summit), the day will start off with the introduction of the speakers. That will be followed by the Key note which will be given by Microsoft. After that, two tracks will be available. By popular demand, here it is. The BI track. For quite a few years now, there has been a noticeable distinction between Power BI and Excel. Now the distinction is still present in almost everyone’s mind, but the bridges between them are growing in numbers weekly. But when it comes down to it, I think that most people see this like this. All that Power BI essentially is, is a user interface that takes you through a three-stage workflow (now I’m using SharePoint terms, run people, run J ). Power Query, Power Pivot and Power View. They all dress themselves differently in Power BI Desktop but essentially, that is what they are, and that is what Excel people see (or should see). With that in mind, the Power BI Track will center around Power Query (Frédéric Le Guen, Oz Du Soleil) and Power Pivot (Henk Vlootman). Final session however, will make that giant leap towards Power BI (Ken Puls). So if you start with the Masterclass on the first day , and finish of with this session, you will start and finish the Excel Summit with Power BI J.
NOTE2: To receive the discount, you must use the above link directly!